Running in a race is one of the thousands millions of reasons we lace up day in and day out. For new runners, this can be an exciting and sometimes nerve-racking item to check off the running list. Our blog friend Brian at Running Without Injuries wrote up a few pointers for your first time heading to the start line. Take a read through and get a feel for what to expect for your first race. Are you feeling good about racing, but need to find the right one to run? Check out where Brooks will be running next to see if there’s a race in your neighborhood here on our events page. Runners are a unique group of people, and if you’re running a race for the first time, there are some things that you should know. The rowdy, adrenaline-filled people waiting at the start line can be a bit intimidating, but don’t fret, most of them are harmless. Runners do some weird things on race day and every day, so to help you prepare, here are my 10 things to remember for your first race. 1. When lining up at the start, let the faster people get in the front. The people holding pace sign are there to help you find your best place to begin the race. This will make the start more comfortable for you and your fellow runners. 2. Not all races allow headphones. Check the races website for specific rules. Music helps many of us get through the tough miles of a race, but some runners like to just focus on running. Keep your headphones from being so loud your neighbor can hear them and leave the Bluetooth speakers at home (Bluetooth earbuds are okay though). Not everyone listens to the same type of music and the younger runners and spectators don’t need to hear some of the explicit language. 3. Leave room on the left for people to pass if you are running slower (or even if you are fast). Racing can be competitive, but don’t intentionally hold others back from a PR. 4. If you are a faster runner and do want to pass a group of people who are taking up the whole path, say “On your left” not “Get out of my way!” Runners are a part of a community, so be kind to each other. 5. There is no need to throw your water cup at the base of the garbage can when it is not even half way full, even if several people intentionally threw the cups on the ground there. 6. Be nice to the volunteers. They are the ones that make the races successful. I try to say thank you to as many of the volunteers as possible. Sweaty high-fives are good too! 7. If someone falls in front of you, stop and help them up. Don’t hurdle them and take off. 8. Prepare for the forecasted weather conditions. If it is going to be hot, wear moisture-wicking clothing that will leave you feeling cooler and will allow the sweat to evaporate. If it will be cold or wet out, layer your outfit so you can take off layers as you get further into your race. 9. Make sure nobody is behind you before blowing snot rockets or hocking a loogie, especially if it is windy. Brooks found this to be one of runners’ top pet peeves in the 2013 Run Happy Nation Report. 10. If you need to go to the bathroom, Use discretion. Don’t take two steps off of the bike path and call it good! Many of these seem like common sense, and they are! Be nice, be courteous and have fun. I would love to hear about some of the craziest things that you have seen at a race. Let me know in the comments! My name is Brian Goldman and I am 36 years old. After several years of cycling I was looking for a change of pace that would fit into my lifestyle. I am married with three young children and have found it difficult to find time to go on long bike rides. In April of 2013, some friends from work started running and I decided to tag along. I never really enjoyed running, but had only run on treadmills in the past. My first run was as 3-mile struggle and I averaged around 12:30 minutes/mile, having to stop several times to catch my breath. Over the next few months I progressed and was running at an average pace of 9:30 minutes/mile. Unfortunately I started developing shin splints. Over the next year I dealt with one injury after another from IT Band issues, to tendonitis, to hip pain. I spent countless hours researching injury prevention and even went to a running coach to change my form. 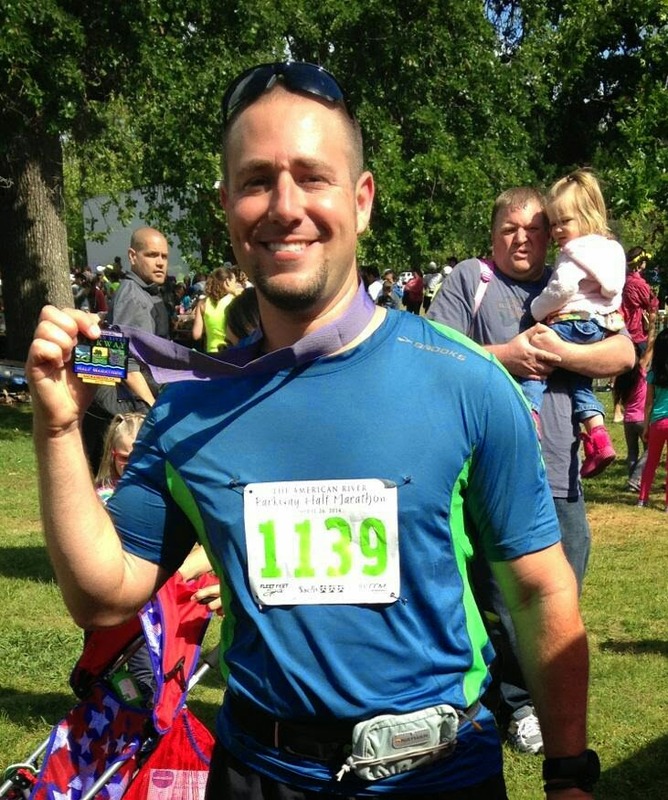 I ran my first half marathon on April 26, 2014 (the American River Parkway Half Marathon) with an average pace of 9:12 minutes/mile. Here are the 15 essentials Scott Jurek used to get through the Appalachian Trail's 2,189 miles.